Consumers shopping on Amazon, and other online retailers, want more information on product pages, including multiple photos and videos. One year ago, I wrote how survey data showed that consumer preferences around more images, receptiveness to personalization, and trust in retailers presented unique challenges and opportunities for brands to succeed. After conducting a similar survey one year later, the desires of consumers around the online shopping experience have grown once again, and noticeably so. For brands, the battle to capture consumer purchases online, and outflank competitors, has risen in intensity and requires more active management of their product pages across retail channels. Below are aspects what digital shelf brands need to address to seize market share in 2019. The data is based on a January 2019 survey of over 1,000 U.S. consumers who bought something online at least once in 2018. Just three short years ago, the average consumer was looking for three images per product when shopping online. Now, that number has doubled, along with shoppers expecting multiple videos on the product page – a media format consumers didn’t really have on their radar screen when shopping back in 2016. Younger consumers are particularly hungrier for rich media content when shopping, but older consumer groups are not far behind. These consumer expectations are especially glaring when viewed in the context of what even top-performing products are doing on sites like Amazon. The average number of images expected on a product page, across all age groups, was six. But when we analyzed the average number of images that the top 10 percent of products by Amazon Sales Rank across six key product categories they had only an average of 4 images per product. Compared with consumer expectations, even these top performers are falling short. As a brand online, you are not simply competing with your category of products. You are competing with every other experience your shoppers have. While in the near term this may mean raising the number of images and videos you have across your product pages, over the long term this entails embracing (at least via testing) emerging product page elements like 360 spins and augmented reality to get out ahead of rising consumer expectations. It’s not unusual to hear a brand, particularly in the consumables space, opine that price is the chief driver of sales in their category. That may have been true in the commerce landscape of the past, but the “endless aisles” of Amazon and other online retailers provide a degree of choice and information for consumers that allows them to make more nuanced purchase decisions based on their needs. Today, nearly 70 percent of consumers chose “not enough information or details provided” as a reason they’ve left a product page – the most frequently selected option. This beat out “price was too high” and even a “concern that the product is possibly fake/counterfeit.” To put it simply – your product page, rather than your brand or your price – is what consumers are increasingly basing their decisions on. “Unfamiliar brand” was the least frequent reason a consumer left a product page. Consumers are more willing to take a chance on newcomer product if the product detail page satisfies their questions. Done right, this can be an enormous opportunity to launch new product lines and build an audience. More consumers, particularly those in younger demographics, care more about reviews and those details on the product page, than a brand they may be familiar with. What’s clear both from this most recent survey along with the 2018 version is that consumers want to be catered to. They have the ability to search for precisely what they are looking for, and it’s easier than ever to compare products to find that ‘perfect fit’ for their needs. As the graphic above shows, reviews play a big role here, but increasingly, consumers are looking for brands themselves to provide answers to their specific questions, right on the product page. 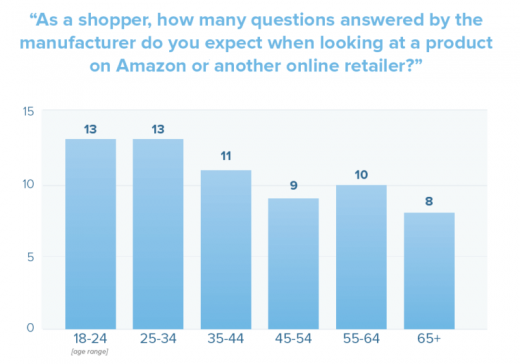 Regardless of age, most shoppers expect an average of 8-13 questions per product to be answered by the brand itself. Doing this across your product pages requires extreme vigilance on the part of your team, but in the short term, concentrating on doing this across your highest volume or highest margin products is a good practice. Brand should also see this as an opportunity to improve their product pages overall. Consumer questions can reveal what’s missing on the product page itself, and we’ve seen successful brands leverage that feedback to make updates to rich media, in-image text, and other product page content. Some retailers also offer on-site chat solutions to field customer questions at the moment of consideration, further creating that feeling of personalized service to the consumer, while also potentially enlightening your team about a shopper’s mindset when they visit the product page. Consumer expectations for their online shopping experience have grown quite a bit, and it’s imperative that your brand be able to both meet these expectations, and have a plan to continue doing so into the future. It’s worth focusing on a subset of key products initially – looking at top competitors on key search terms, why they are outranking you, and working to improve your pages based on those learnings. That may be improving your rich media, looking into review programs (e.g., Amazon Vine), or improving your Q&A section. This will also help gear your organization up for the repeatable, cross-departmental process needed to execute on improvements across your entire product catalog over time. Andrew Waber is the Manager of Data Insights and Media Relations at product experience management (PXM) platform provider Salsify. In his current role, Andrew manages the analysis, editorial direction, and strategy for Salsify’s public facing reporting on the online retail marketplace. Prior to his time at Salsify, Andrew served as the Manager of Market Insights and Media Relations for advertising automation software provider Nanigans, and as the Market Analyst and lead author of reports for Chitika Insights, the research arm of the Chitika online ad network. Andrew’s commentary on online trends has been quoted by the New York Times, Re/Code, and The Guardian, among other outlets.